Jennifer Criswell is a lawyer turned writer. After a trip to Italy in 2001 changed her life and her direction, she chucked her legal briefs to pursue her love of writing. Jennifer followed this dream to New York City where she supported herself (just) for over six years by walking dogs on the Upper West Side. 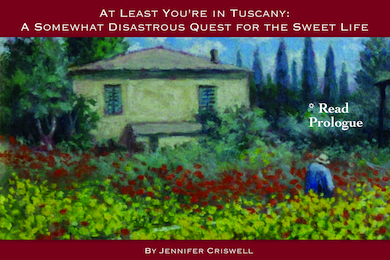 Jennifer has authored three novels, and her current project, AT LEAST YOU’RE IN TUSCANY: A Somewhat Disastrous Quest for the Sweet Life, is an honest and funny memoir about the reality of following your dream. Jennifer lives and writes in a small hill town in Italy with her sidekick of a Weimaraner, Cinder. They are always on the look out for new adventures… and new gelato flavors!